It’s International Hot Sauce Day and in honor of this auspicious date let’s take a look at at how chilis have rocked our world and spiced not only our pizza slices (shout out to Tobasco) but our entire lives. We tend to take them for grated today, but there was a time when spicy food as we know it was not available to the majority of the world’s population. Tomascastelazo . Source: Wikimedia Commons. When most people think of chilis, they think of Indian curry or exotic Thai dishes, but for most of Human history the delicious family of peppers was only found in the New World. Chilis were domesticated in Mexico a little more than 6,000 years ago, making them one of the earliest crops domesticated in the Americas. The colorful littler peppers were used to add flavor to meals and also for medicinal purposes. Cultivation of chilis spread to South America within only a few centuries. From that point the plant’s range remained stagnant, until a certain crazy Italian took the wrong route to Asia. The real reason Columbus sailed West was in search of spices, and interestingly it is spices, along with crops such as corn and beans that are probably the greatest contributions the Americas have given to the rest of the world. Modern corn production, for example surpasses that of wheat and rice. Corn is an important staple food in many developing nations thanks to its ability to grow in a wide variety of ecological conditions. Cassava is also an important staple in many parts of the world. While the Conquistadors were obsessing over gold, the rest of the world was reaping a more lasting benefit from the Columbian Exchange: a better way to feed itself. 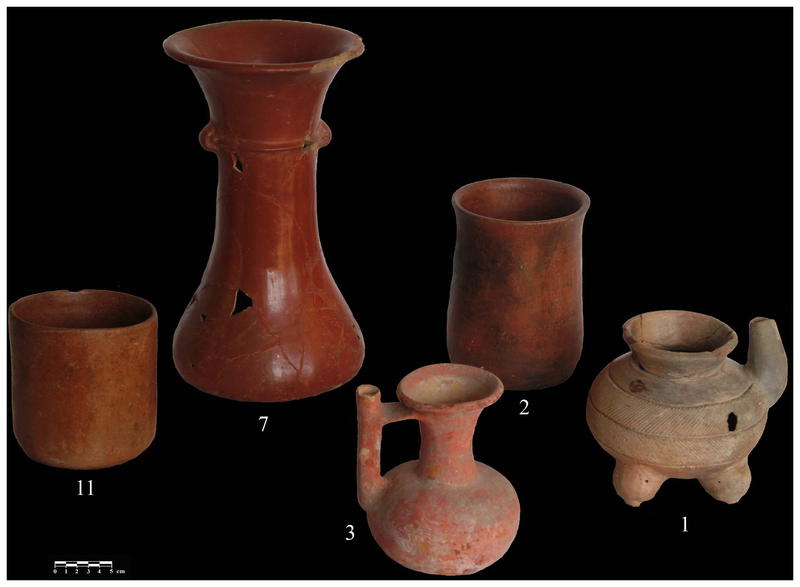 Image of the five vessels that tested positive for Capsicum from Chiapa de Corzo. Source: Wikimedia Commons. Anyway, back to chilis. 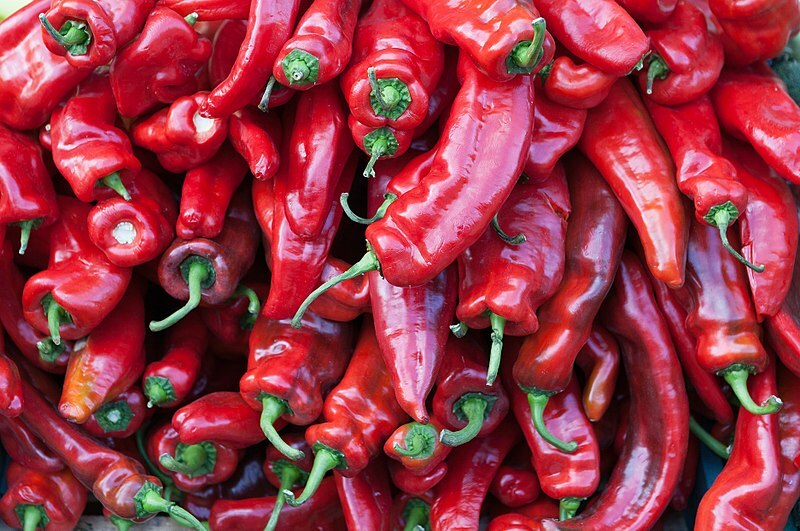 Hot and spicy food did exist in the Old World before chilis were introduced. Black pepper had been in use in both Europe and Asia for centuries. However chilis are more pungent (aka hot and spicy) than black pepper and easier to grow. Peppercorns had been a luxury only the wealthy could afford. Chilis, on the other hand were easily grown in a variety of climates. Chilis took a while to achieve popularity in Europe, but they spread faster through Asia than any other New World Crop. Many Eastern cultures were initially reluctant to adopt most of the plants being introduced from the New World. This fear of new foods may sound strange now, but if you look at it from their perspective it makes sense. I mean, how often are we told as children not to eat strange plants? Combine that understandable fear with the fact that it was European traders (who have a dubious reputation for the giving of ‘gifts’) who were offing these exotic plants and it’s easy to see why these cultures didn’t take kindly to them. But that was not so with chilis. The little pepper’s ability to introduce flavor to the plates of the poor quenched any initial fear of the plant. Image of Calicut, India from Georg Braun and Frans Hogenberg’s atlas Civitates orbis terrarum, 1572. Source: Wikimedia Commons. Today, with the increasing popularity of Indian and East Asian cuisine in the United States, the chili is being reintroduced to its native hemisphere in new guises. In fact, Asian cuisine features the pepper so prominently that many Americans believe chilis come from the Old World. However if you’re looking for someone to thank for the Tobasco you’re dripping on your pizza slice (or whatever chili-garnished treat you prefer) on this special day, look much closer to home. Thank the ever-underappreciated Native Americans. And if you’re curious to learn more about the great diversity of Native american cultures, come see our McGovern Hall of the Americas, were we have hundreds of objects on display including Meso American stone grinders that may have been used to process chilis! Previous Post Are Zombies Real? Our Education Team Investigates!